Taking care of my parents. 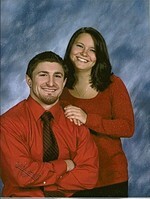 Angela 21yrs Ohio State Jr.
God has blessed me with a great husband of 24yrs. And two great kids. I tought preschool for 5yrs. and then stayed home to raise my son and daughter.I went back to work at U.D.S. preschool.Now i am home taking care of my parents who are sick. Getting married and having my two kids. We love going to the beach every year and relaxing. Debbie Shellhorn Manoogian has a birthday today.